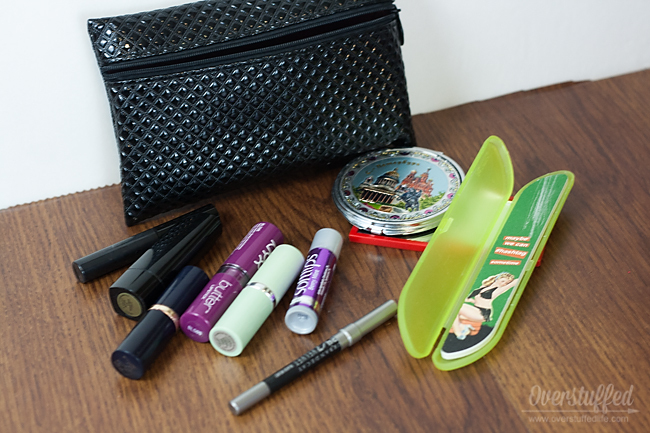 A long time ago, I wrote a post about what every woman should have in her purse. The list of items we women need to carry around with us is very long, my friends. And as I go back and read the list (it was only a half serious post), I realize it was woefully short. Nowadays I carry a lot more than that, as do most women I know! 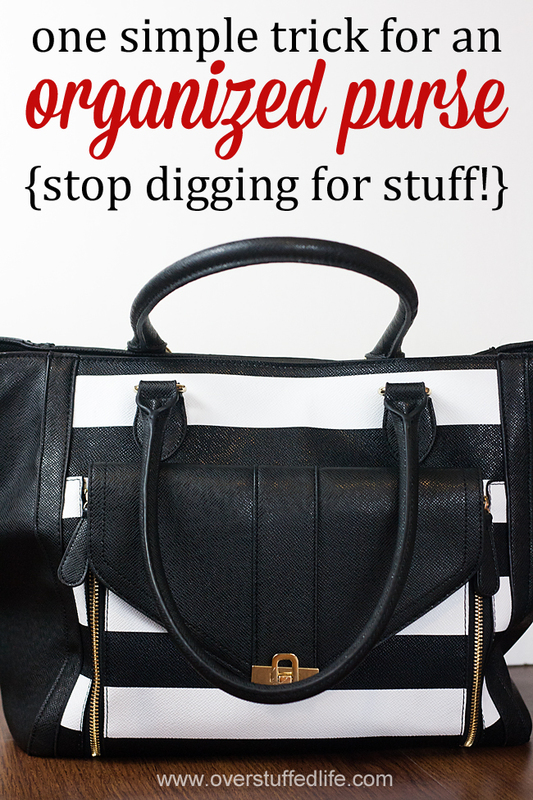 The problem with carrying so much stuff—necessary stuff—is that it often gets completely jumbled up inside the bag and we are constantly digging for the thing that we need. There is nothing more annoying than needing a pen and knowing you have one in that purse somewhere, but not being able to find it. Well, maybe something more annoying is coming up with handfuls of old receipts and candy wrappers instead. Which is why I just got myself a brand new bag! I had a purse I loved, but the handle broke about six months ago. At the time, there wasn't much money in the budget to replace it, so I headed to the consignment store and found something that would do. And it did do for the last six months, but I really hated that purse. It was floppy and had very few compartments and I could never find anything, despite my habit of keeping my purse really organized. I found that because I couldn't organize it the way I wanted to, it tended to collect more junk than usual. It was awful. Anyway, I have a trick that I use to keep my purse organized. 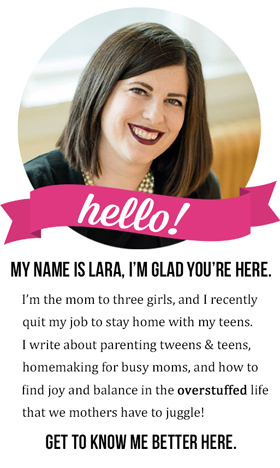 It's super simple, but incredibly effective, and I thought I'd share it with you today. While we're at it, we'll talk about what is actually in my bag and why. And, also, I just wanted to show off my great new purse! First, let's look inside to get an idea of the way it is organized. Now, I realize that my purse is pretty large, and I like it that way. I need to have a purse that will fit my planner as well as a book or my Kindle. You may not want to carry a purse that is so large, and that is just fine. The organization trick I am going to share with you will work for any sized purse, except for super small ones. But super small purses are really just wallets and don't need the level of organization that larger bags do! 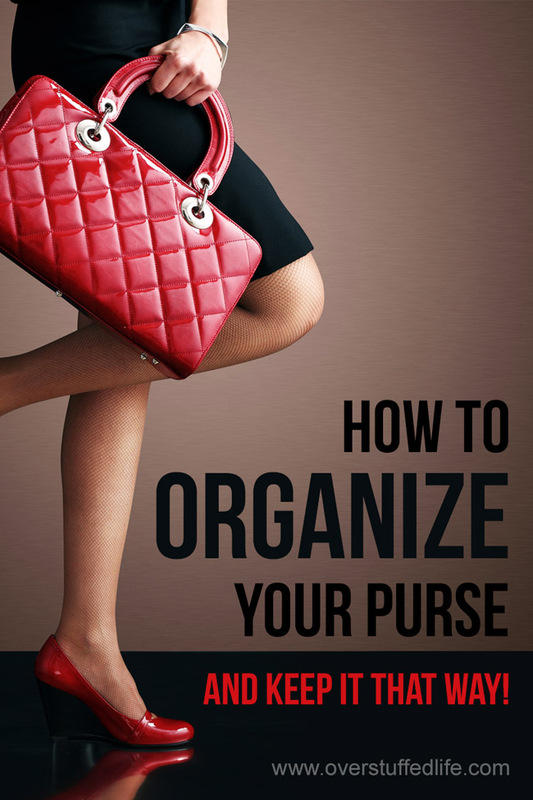 A purse that has more compartments will stay more organized. This isn't my trick, but it is an important truth that every woman should repeat to herself while shopping for bags. That was the problem with my consignment store purse. While it was cute and I liked the pattern, it had only one zipper pocket and had no compartments at all. 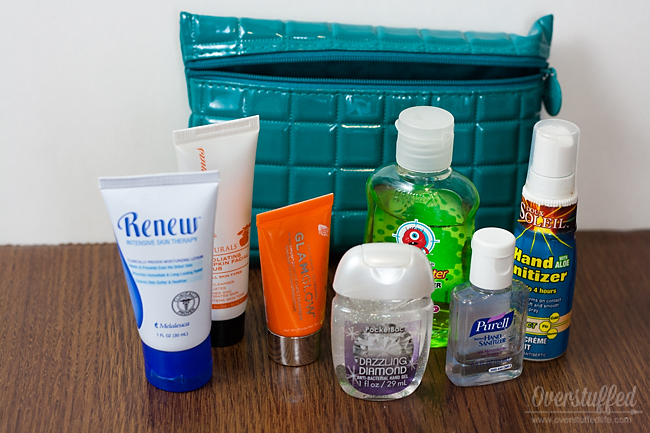 When a purse is nicely compartmentalized, you can organize it in a way that you know where everything goes and where to find it when you need it. But no purse has quite enough compartments to make it that easy. And that's where my purse organization trick comes in. 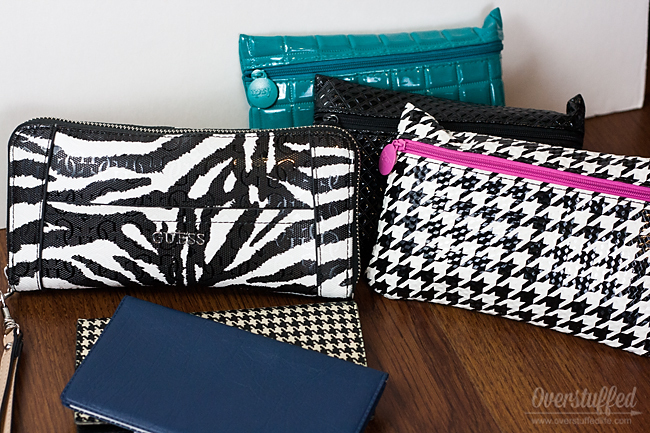 Use smaller bags to keep your purse organized. That's it! I actually just use cosmetic bags that I receive from Ipsy every month. I pick my very favorite ones—the ones that are mostly Type 4 Energy!—and I use them for various categories of organization within my purse. Everything stays put and doesn't spill all over the place and is easily found when you need it. 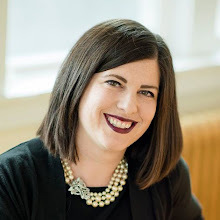 Another plus to this method is that you can change your purses very easily, if you are a person who likes to change your bag with your outfit. All you have to do is move the smaller bags and a couple other things instead of dumping your mess into a new bag. Small cosmetic/pencil cases are super easy to find, even if you don't have a monthly Ipsy subscription. I like these mesh ones—you can get a set of 6, each a different color. The mesh would allow you to see the contents easily. If you're a fan of animal print, I love this zebra bag and this leopard bag. And hello? These Vera Bradley cosmetic bags come in a huge variety of patterns and who doesn't love Vera bags? Let's take a closer look at my purse and see how I've put it all together. Every purse generally has a small zipper pocket inside. I keep my earbuds and the connector thingy I have to have to use them with my phone because I use a Lifeproof case. 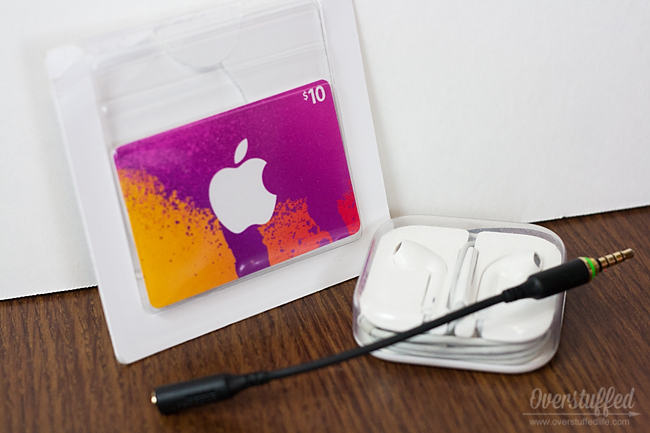 I also have an iTunes gift card in there because I bought a pack of three and gave two of them to my kids and still have that one left. I just haven't put it into my wallet yet (or, better yet, on my iTunes account!). My purse is divided into two sections with a large zipper pocket between them. 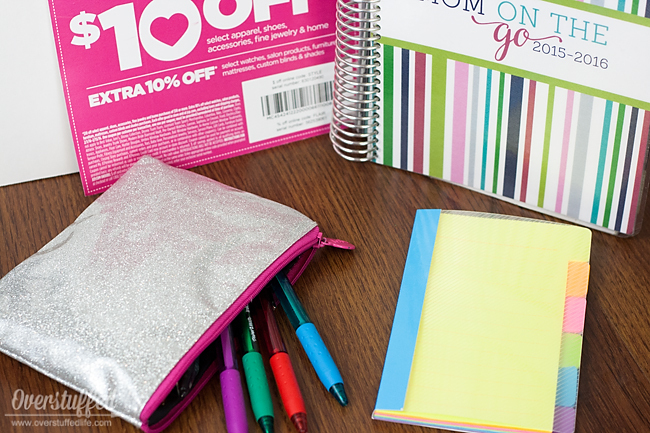 On one side, I keep my planner, a snazzy sparkly silver cosmetic bag which is full of colored pens (I like to color-code my planner), a book of tabbed sticky notes, and a humongous coupon for JCPenney. Why do they have to make the coupon so big? I need a giant purse just to hold that! If I have my Kindle or a book with me, I keep it in that same compartment. In the opposite compartment, I have my wallet, two checkbooks, and three make-up bags which each serve a different function. I would show you the contents of my wallet, but it's really not the wisest thing to put my credit cards online for all to see. Basically, I keep credit cards, insurance cards, ID cards, cash, coins, coupons, receipts, store loyalty cards, business cards, and all that sort of stuff in there. It's nicely compartmentalized so it stays fairly organized, too. Let's check out each of those cosmetic bags. It also usually holds a travel pack of Kleenex, but I have run out and keep forgetting to replace it. This is my "lotion and hand-sanitizer bag." Apparently I have lots of different kinds of both. 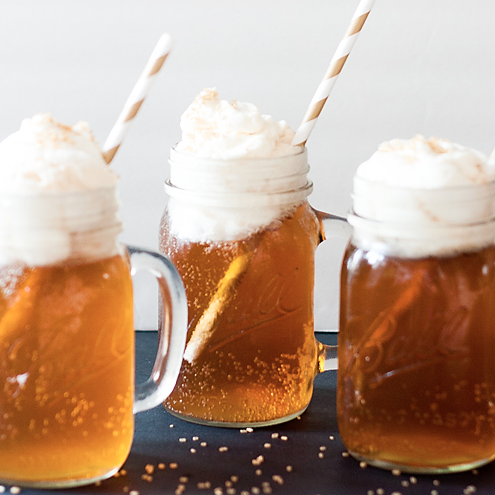 But hey, when you have kids, you need as much "hanitizer," as Sophia calls it, as you can get! I have a mini Purell, an apple-scented Germ-X, a Doux Soleil which I love and is almost gone, and a sparkly one from Bath and Body Works. And since it's winter right now, my hands are always needing more lotion, so I've got a bunch of that, too. This cosmetic bag is actually being used for cosmetics! Amazing. I just have basic stuff in there like three lipsticks (because I am never caught without lipstick), an eyeliner, a trial-sized mascara, a lip balm, a couple compact mirrors, and a funny nail file. Let's take a closer look at it, shall we? 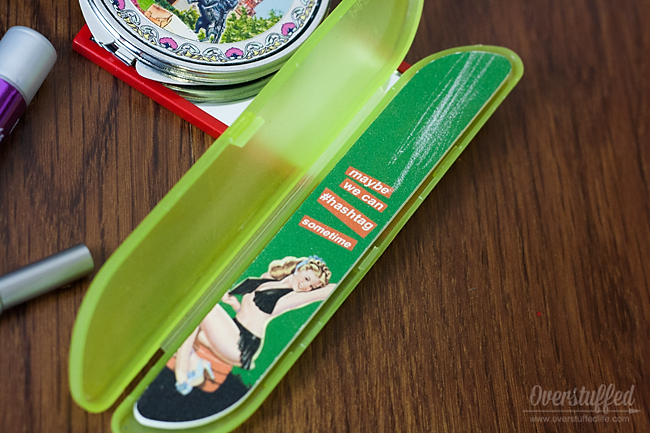 It came in one of my beauty subscriptions, and while it's a little racy, I do love that it has a case. Finally, in the appropriate inside pockets I keep my sunglasses, my reading glasses, and my phone. 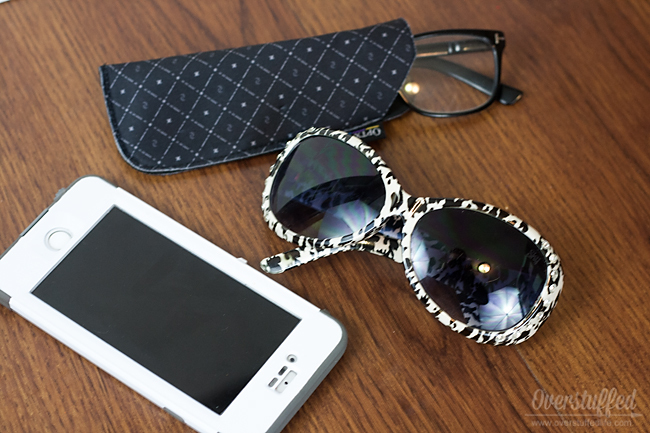 Your phone especially should always have a designated pocket, and most purses do comply with that requirement. However, many purses are behind the times with the pocket size and still only fit smaller, older cell phones in the phone pockets, so watch out for that if you have a larger phone. I keep my keys in the front pocket (no need for a photo), and I have nothing in the middle zipper—at least, for now. That's it! 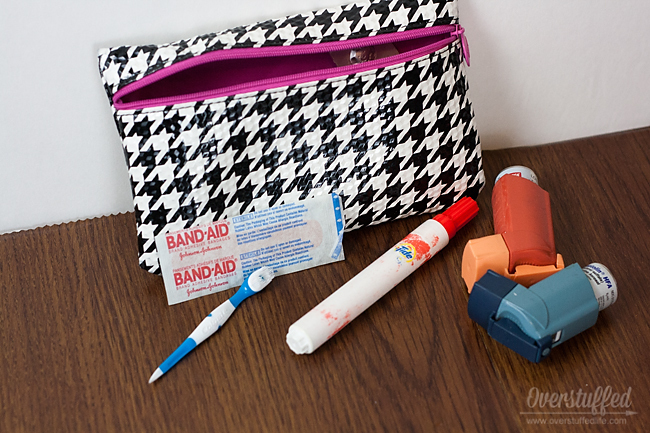 Those are the necessities (minus the Kleenex) I keep in my purse, and my super easy trick for keeping it organized all the time. 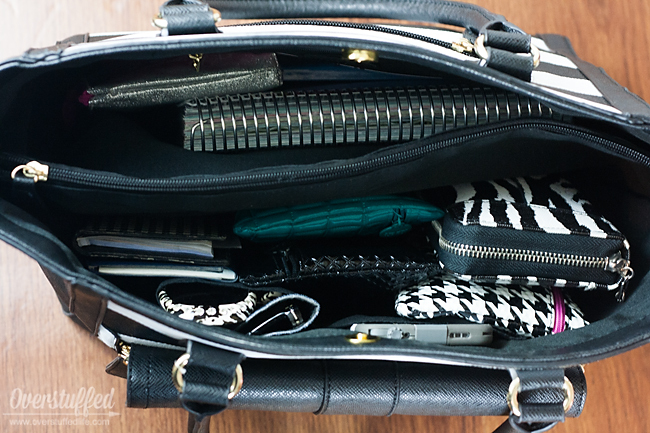 How do you keep your purse organized?